Researchers and development practitioners don’t often team up to co-lead large global projects for a number of reasons. They have different audiences, timelines, and motivations, making collaboration, let alone co-management, challenging. Researchers tend to design and test innovations and work at the global level with a long-term perspective. Practitioners, on the other hand, tend to scale innovations, work on local livelihood improvements, and focus on the present. But even though this type of partnership isn’t very common, we each need the other to be able to solve seemingly intractable global problems like hunger and poverty. A Feed the Future project aimed at strengthening global agricultural extension systems called Developing Local Extension Capacity (DLEC) is a rare example of an extension researcher and a development practitioner teaming up as co-directors. As a senior research fellow at the International Food Policy Research Institute (IFPRI), a think-tank that seeks to provide solutions to sustainably reduce poverty and end hunger and malnutrition, and vice president of strategy at Digital Green, an international NGO that has reached 2 million famers through its community video extension approach, we represent different sides of the development world. Yet the collaboration has proved effective because development organizations need researchers to share what works across different contexts, and researchers need development practitioners to execute and scale the most promising solutions. We explored this critical issue during DLEC’s 2nd Annual Global Community of Practice convening on March 20th in Kampala, Uganda. The theme was data-driven extension: how to encourage more data and evidence sharing and collaboration across the full range of stakeholders. We convened panels of prominent researchers and on-the-ground implementers. The difference between presentations was stark: researchers talked methodologies, equations, and results expected in 2-5 years while practitioners described tactical operations, field realities, and short-term outcomes. There wasn’t necessarily a conflict, just two critical development stakeholder groups with different perspectives and motivations that are sometimes in opposition. Yet, we find ourselves optimistic, and for good reason. We are living proof that the divide can be overcome. 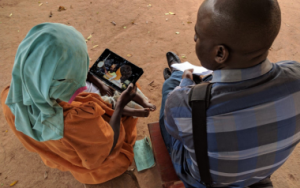 One of the recent examples is the DLEC-facilitated randomized controlled trial in Ethiopia by IFPRI comparing the effectiveness of Digital Green’s community-video extension with the traditional government approach. What’s the main difference? In the traditional scenario, extension agents pay occasional visits to individual farmers and provide information on good agricultural practices. The Digital Green approach is to train these same extension agents to produce short, relevant videos featuring local farmers; disseminate the videos to groups of smallholders in a participatory manner; and track the adoption and real-time feedback of farmers. The trial looks at access, knowledge, and adoption by a sample drawn from the 400,000 farmers currently reached through the project, in addition to other indicators such as yield and income of participating farmers, motivation of extension agents, and cost effectiveness of the approach. The two-year trial will be completed this year, with year-one results looking quite promising. Close collaboration and strong working relationships that IFPRI and Digital Green developed during the project enabled a well-executed evaluation despite the national crisis that erupted in 2018. Both parties cite two main reasons for the successful partnership: 1) open lines of communication throughout, and 2) Digital Green’s strong desire for the evaluation and perceived value in its completion. Another example that boosts our optimism is the testimony from Ugandan colleagues during our Convening. Government, academia, NGOs, and the private sector are coming together through the Ugandan Forum for Agricultural Advisory Services to address critical extension challenges in the country through research and practice. This DLEC-supported platform has served as a neutral space to convene dialogue on the future of Ugandan extension and contributed to the Guidelines, Standards, Code of Ethics and Procedures for Registration and Accreditation of Agricultural Extension Service Providers in Uganda. The Forum has strengthened mutual respect and collaboration among stakeholders. And that's a wrap on our 1st Lightning Talks panel of the day! Radio, video, phones and scaling innovation! And the last reason we are optimistic is because one size never has and never will fit all—we need “best-fit” solutions in extension—and context will always matter when identifying solutions for the intractable global challenges we are trying to solve. Practitioners will continue to need the evidence from researchers to show what works across different contexts and the know-how to scale those promising solutions, and researchers will need real-world evidence from the practitioner field to have any hope of influencing policy to create positive impact in the world. We’d love to hear more reasons why you too are optimistic about bridging the researcher-practitioner divide. Join DLEC’s Global Community of Practice and share your stories! Karin Lion is Vice President of Strategy, Digital Green and Co-Director, DLEC. Kristin Davis is a Senior Research Fellow with the Development Strategy and Governance Division (DSDG) and Co-Director, DLEC. The DLEC Convening was funded by the U.S. Agency for International Development through Feed the Future Developing Local Extension Capacity (DLEC) Project and the CGIAR Research Program on Policies, Institutions, and Markets (PIM), which is led by IFPRI and carried out with support from the CGIAR Trust Fund contributors and through bilateral funding agreements. Digital Green’s work in Ethiopia is funded by the Bill & Melinda Gates Foundation (BMGF), while the IFPRI evaluation in Ethiopia is funded by BMGF, DLEC, and PIM.